As we know, Valentine’s Day is just a couple weeks away. The day may be filled with roses, fine chocolates, and candlelit dinners. However, before the day comes and it’s time to pucker up with your significant other, you should make sure your dental health is in line. Dental problems come with a host of consequences – to include relationships or lack thereof, that is – depending on your situation. As your Glen Mills dentist, we want to ensure you are prepared for the Valentine’s Day festivities, which is why we are going to share five dental problems that can seriously affect your romantic date, as well as your oral health. Your smile is one of the first things people notice about you, so having yellow teeth on this day of love is far less than favorable. If you struggle with discolored teeth, you’re not alone. Many adults struggle with tooth discoloration and find it embarrassing to show off their teeth when smiling. There are a host of factors — from what we eat and drink to our dental habits — that may cause your teeth to discolor. Luckily, our dentists can help you achieve a brighter smile with our teeth whitening options, just in time for your Valentine’s Day date. Tooth decay, more commonly known as a cavity, can be prevented by following a proper dental routine. However, according to a study from the National Institutes of Health and the Centers for Disease Control and Prevention. 96 percent of Americans have tooth decay by the time they hit 65. Not only is tooth decay unattractive, having cavities that have not been filled by a dentist can lead to further problems, such as gum disease, infections, and unbearable pain. Don’t let cavities leave you in discomfort during this holiday of love. Crooked teeth can cause a less than attractive smile. If you are one of the millions of people who have crooked teeth, you know it can also affect your confidence. But don’t worry! Our Glen Mills dentist office offers a variety of options that can transform your smile. Make an appointment today to learn more about ClearCorrect braces and Invisalign clear braces today! Bad breath can be a total deal breaker when it comes to going on a date. Not only can it cause your date to lean away when it’s time to plant a kiss, but it can also be a sign of something more serious. Typically, bad breath is an indicator of a dental problem, and it should not be ignored. The underlying causes of bad breath include cavities, periodontal (gum) disease, oral cancer, dry mouth, and bacteria. How can you stop bad breath in time for your Valentines Day date? While brushing, flossing, and rinsing with mouthwash daily can help with eliminating bacteria that causes bad breath, if it is a recurring thing, you should make a dental appointment with our Glen Mills dentists to identify the root cause. On special days like this, it’s natural to want to look your best — and a chipped or broken tooth may be getting in the way of your self-confidence. Don’t worry! Today, cosmetic dentistry can resolve smile problems like never before. Small chips, cracks, or other minor irregularities can often be resolved with a treatment called cosmetic bonding. With a quick visit to the dentist, you won’t even be able to tell your tooth was broken in the first place! If you are struggling with any of the dental issues above, take care of the problem before it’s too late! 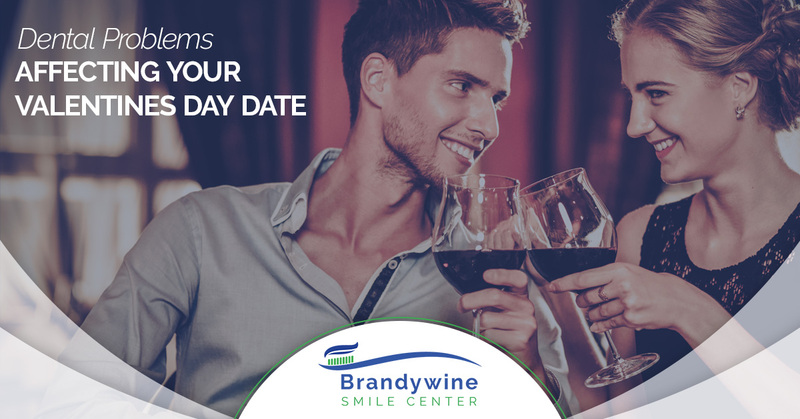 Contact Brandywine Smile Center to schedule an appointment today!